Now that “UFC 142: Aldo vs. Mendes” is officially in the books, make sure to stream tonight’s post-fight press conference live right here on 5thRound.com starting at approximately 12:15AM ET/9:15PM PT. 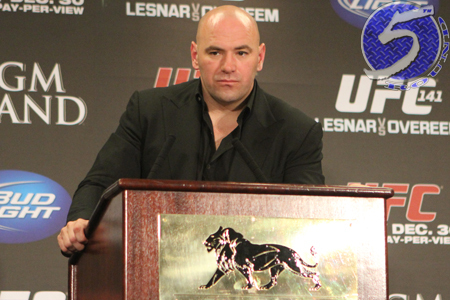 In addition to UFC president Dana White (Pictured) and the card’s featured fighters, the other notable athletes that won’t require medical attention are also expected to face the firing squad. In the night’s main event, featherweight king Jose Aldo defended his crown in spectacular fashion by knocking out Chad Mendes with only one second remaining in the opening round of their championship affair. UFC 142 took place inside HSBC Arena in Rio de Jenairo, Brazil.